In a world where Magic is illegal. Cassel Sharpe has the most deadly ability of all. With one touch, he can transform any object - including a person - into something else entirely. And that makes him a wanted man. The Feds are willing to forgive all his past crimes if he'll only leave his con artist family behind and go straight. But why does going straight feel so crooked? For one thing, it means being on the opposite side of the law from Lila, the girl he loves. She's the daughter of a mob boss and getting ready to join the family business herself. Though Cassel is pretty sure she can never love him back, he can't stop obsessing over her. Which would be bad enough, even if her father wasn't keeping Cassel's mother prisoner in a posh apartment and threatening not to let her leave until she returns the priceless diamond she scammed off him years ago. Too bad she can't remember where she put it. The Feds say they need Cassel to get rid of a powerful man who is spinning dangerously out of control. But if they want Cassel to use his unique talent to hurt people, what separates the good guys from the bad ones? Or is everyone just out to con him? The Curse Workers series is one of the finest young adult fantasy/paranormal series. 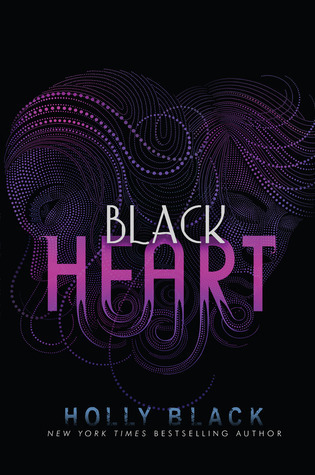 Black Heart continues the excellent pace of the prior books. It doesn't entirely capture the magic of the first book, White Cat, but hardly any series ever can beat the first book. Male narrators are always a refreshing change of pace and Cassel's voice is hard to beat. I love seeing how he's changed throughout the series. He feels more humble but at the same time more confident. I suppose he's less arrogant in the right ways. One of the key elements of White Cat was getting Cassel to trust his friends. Sam and Daneca are now significant parts of his life, but he still has plenty of reasons not to trust people. Other than Sam, no one is completely straight with Cassel. And many of his burdens are his to shoulder alone. I felt a little bad for him at times, although the lone battle shows the strength of Cassel's character. He remains snarky and ingeniously crafty. He is devoted to his family - surprising given his brothers' betrayal of him - but also sees their faults with open eyes. Cassel has become his own man. 'Okay, Cassel. She seems like a very ruthless girl whom you like very much.'" She is without a doubt someone you do not want to mess with, but Cassel loves her for it. She will always "wear the pants" in any relationship. Cassel is comfortable enough with himself and adoring enough of Lila to admire her inner strength - even though it often comes off as remorseless killing. The plot of Black Heart is what I've come to expect. A complicated, twisting criminal tale. You can't be sure who the villain is - the Zacharaovs, the government, Barron, Mom, Cassel? The only one who is consistently innocent (nowadays) is Grandad. The story drags at time, but there's so much to contemplate that the slowness feels necessary. There are actually two distinct subplots. I can't decide whether I like this or not. One involves Cassel's friends and one involves the government/family/Zacharovs. Part of me likes having so much going on while another part of me thinks that a stronger plot could have joined everyone together and not felt so disjointed. Regardless of whether the story was perfect, Cassel is definitely my ideal con-man. Unlike most of the people surrounding him, Cassel's instincts are to do the right thing. That makes him likable to the readers even when he's committing crimes or manipulating his friends, family, or colleagues. A satisfying ending to an incredible series. I loved Cassel in this book and he's definitely the perfect con-man. If only we had more adventures with him . . . anyway great review! I love this series and I really like they way they ended. I will miss Cassel though! The las book had me guessing constantly. I was reading with my "what" face on. Great review. I love this series, especially because that it is genre bending and the plots/characters are many layered and complex. I'm really hoping for a spin off series as I'm sad to say goodbye to these characters. I've heard such great things about this series, I have no idea why I haven't picked it up yet. I even have book one on my shelf. I fail. Love the sound of Cassel, and I never tire of a brilliant male protagonist so I need to get on the Curse Works train Alison! I've heard such wonderful things about Holly Black, yet I still have not read any of her work...eep! I'll have to get to this series, it sounds great! Adored this ending. I loved how it didn't tie up every single loose end. Such a great couple, too. Fantastic review, hun! I have been meaning to read this series - thanks for the reminder! I have yet to read anything by Holly Black - but I so do want to. It's a bit peculiar how I got curious about this author ... her blurbs on other books seemed quite interesting! Hopefully I'll start (& finish) The Curse Workers this year. What you said about a series not being able to beat the 1st book... What do you think about Vampire Academy? I found the premise to have matured & grown more dangerous as the series progressed. Glad that this was a satisfying ending the series! I really need to catch up and start Red Glove soon. Oh, I know, I just adore Cassel, as well. Definitely one of my favourite male protags. You're absolutely right, even as a criminal he always manages to do the right thing in the end. I thought this was a pretty great conclusion to a fantastic series, as well! It's good that they have been able to provide enough information about the issue. How to Read with Distractions? Guest Post - 3 Books Till I Walk the Plank!